Is It Safe To Keep Pitbull As Pet? Some years back, a 56 year old woman was inexplicably attacked and mangled by her family’s pet, a Pit-bull when she was about to feed the dog. The woman died after sustaining multiple bite wounds in different parts of the body. When the rescuers arrived at the scene minutes after receiving that distress call, they saw the bloodied woman still struggling to get free from the beast hideous teeth. It took the rescuers 5 minutes to unlock the dog’s mouth and free the woman from its razor like teeth. But it was too late, the woman died on her way to the hospital. Immediately after the beast was set free from its prey, the canine monster ran away. But the rescuers had quietly captured the killer Pit-bull and lock it up. The immediate question comes to one’s mind, is why in the first place that happened? Other more intriguing questions also ensued: Is the Pit-bull more dangerous or more likely to attack humans than other breeds of dog like Rottweiler or German Shepherd? When a dog becomes wild , is it the dog’s fault or the owners? How can a Pit-bull owner ensure his pet will not lunge at him, her or other people? Experts from the Royal Society for the Prevention of Cruelty to Animals (RSPCA), a global organization based in UK had these to say, that Pit-bulls can be considered as more dangerous than other dogs because they were bred ‘not to guard or hunt but to viciously rip other dogs to death in pits while their blood thirsty owners cheered’. 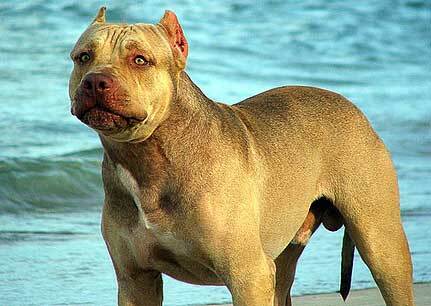 Pit-bulls were bred from Stafford-shire Bull Terriers and Bull Mastiffs. They can literally severe limbs. However, unlike German Shepherd which lock their jaws. Pit-bulls move their back molars once they have bitten. Their lower jaw scissors back and forth to severe flesh from the bone. They are not large dogs but they have an enormous power to weight ratio. Their jaw strength is far greater than any other dog. A Rottweiler will exert 800 pounds per square inch (psi) jaw pressure, a Bull Terrier will exert 1200 psi but a Pit-bull will exert more than 2000 psi. You can have savage Labradors or Chihuahua, but none of them has the potential to maim and kill that a Pit-bull does. The expert also noted that 42% of all dog related deaths in the US are from Pit-bulls, although the latter constitute only 1% of all dogs. 70% of these deaths were children. Rottweilers or Dobermans could be savage because they are both territorial, they will defend their space. But Pit-bulls are not savage because they are just unpredictable. However, some people would beg to disagree that Pit-bulls are intrinsically dangerous dogs and the problem lies with the people who owns them. They would say that Pit-bull could be likened in any other dog when it will loved, trained, exercised and cared for it will behave properly in return. Others would say that Pit-bulls are excellent family companions and have always been noted for their love of children while some would say that Pit-bull is not the choice for guard dog since it is extremely friendly even with strangers and aggressive behavior of dog towards humans is uncharacteristic of the breed and highly undesirable. In the end, it comes down to who would you believe in. With all the information about Pit-bulls at your disposal, the question is: Are you willing to take the risk? Is Global Economic Recovery Improving?